I heard the pitter patter of not-so-little feet coming up the steps and I knew it was time to grab the pliers and pry open my eyes. I looked over at the clock. Oh, morning. You have no mercy. I rolled over and saw Jack, my eleven year-old standing next to his Dad's side of the bed. "Hey, Mom. Is Dad in the shower?" "No, bud. He left for a trip really early this morning. Just a quick one, though." "WHAT? ", my boy furrowed his brow. "Another trip?" "Yeah, but just a quick one. He'll be home tomorrow." "But, it's just...well...it's just that I made him breakfast this morning. I've never done that before." My eyes popped open. Oh my word, what did this child do? Did he turn on the stove? Is there a HUGE mess down there that somehow in my comatose state of "my husband was up at 4am and I didn't sleep well", I didn't hear a thing. I rubbed my eyes ready to slide out of bed to go survey the damage and looked up at Jack. "Oh, buddy. I know it's hard. But, he'll be back tomorrow." He wiped his eyes and left to go downstairs. I stumbled out of bed, threw on a sweatshirt, walked past the baby's room - where I heard babbling and singing - and headed to the kitchen. Jack, Max, and Lincoln were all sitting at the kitchen table eating a bowl of cereal. I glanced around the room looking for signs of disaster, but found just cereal boxes and the gallon of milk in the middle of the table. Jack seemed to have recovered and was leading a serious and important discussion about the latest Avengers movie. I headed over to make a cup of ambition for myself, when I spotted it. The sweetest "Made for Dad" breakfast ever. What's a mama to do but cry? You know, as a mother, this is some of the hardest stuff I do. 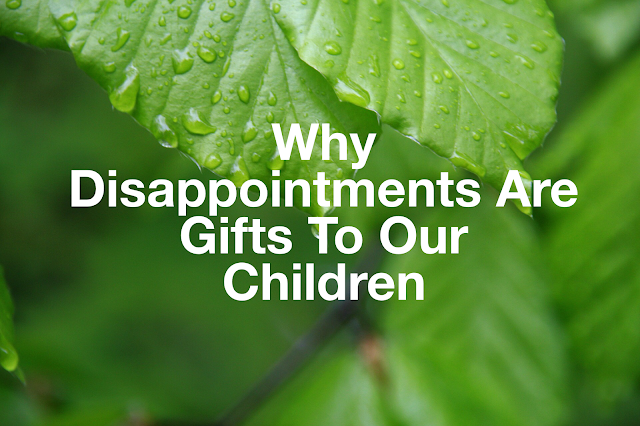 Processing and handling the things that hurt my children - their disappointments, their fears, the things in life that are such letdowns to them - this is hard stuff on my mama heart. Isn't it like that for all of us as mothers? Oh, how their hurts slay us. These disappointments are GOLD. Treasures. Priceless gifts in raising children. 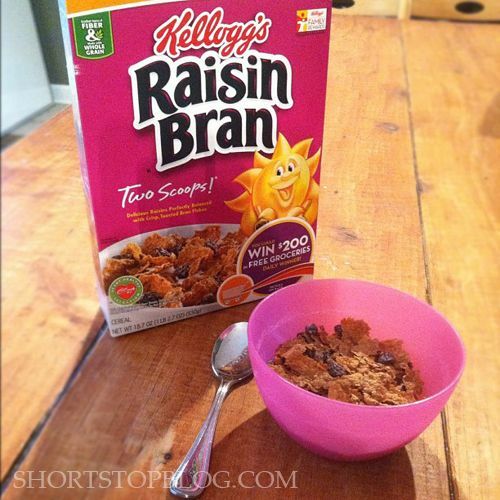 Today, when Jack gets home from school and I have time to sit down and talk to him about what that bowl of uneaten Raisin Bran REALLY means, I will have an opportunity to show him what God has taught me. Our hurts and disappointments really point us to God's love for us. The love Jack has for his Dad that prompted him to wake up today and pour that bowl of Raisin Bran, the relationship that has been nurtured since the day they laid eyes on each other, the eleven years of bonding, sharing, car-racing, book-reading, bike-riding - this is God's love poured out on my boy. He has a Dad who loves him, and he loves his Dad. The love in our family - God has given that to us. And, that we miss each other when we're apart makes us newly aware that God has been so good to us. And, when we choose to focus on that, our sadness turns to joy. It's taken me thirty years to see this in my own life - to process my own fears and disappointments this way. When Satan wields the spear of "God doesn't love you because..." and we wield the sword of "But, I'm so grateful for..." against it, well - we find joy in the goodness of God. Thankfulness. It is the antidote for disappointment. My children. They will be disappointed again and again. My hope is that they learn to lift their eyes in thankfulness to the One who loves them more than any other, even in the midst of hurt or sadness. So this afternoon, when I sit down with my Jack, that uneaten bowl of cereal gives me an open door to remind my boy that missing each other when we're apart is a great gift to us. And, together - he and I will use thankfulness to slay the power of what isn't, what we don't have today, who isn't here today. The love in our family. I always, always love each of your posts, and this one was no exception. Timely words for me as a parent, timely words for me as a human. Such a sweet story, thank you for sharing. Attire, facial surgical procedures, highly-priced chanel replica sale are especially an area of the synthetic version chanel baggage to search superb. When the following synthetic version chanel baggage is definitely fine many find themselves paying out loads of tag heuer replica around endeavoring to acquire the following intent. Nonetheless you can find a person just simply solution which may like magic , hermes replica sale a person's look and feel. Inspite of its term, dark colored loopholes are usually not only clean space or room. Fairly, they can be a tremendous degree of topic constricted within a really compact vicinity. Your set chanel replica is likewise something which might pick just about nearly anything in the current wardrobe. There are a selection with synthetic version chanel baggage who want to cut pain of owning so that you can synthetic version chanel baggage plus coordinate all for their current wardrobe plus owning something which might pick louis vuitton replica sale can come for a substantial benefits to get that they. Dark colored synthetic version chanel baggage may perhaps be of your supermassive wide range, however can even be with different watches stellar huge. We had a similar situation just last night with Dad gone on a quick trip and disappointment and tears. I needed this new perspective. Stumbling onto your blog this morning was a blessing from God. Thank you! Excellent! As I read your words I was again reminded that our good God loves us so much, and that I need to be thankful for the good father he has given our children. We have six children, and their Daddy went to heaven 10 years ago. We still miss him so very much, for his trip is not quick at all...but we know we will see him again one day. Thank you for this wonderful reminder to continue to share with my children. God is good. God loves us. So fantastic. I am a mother of 4 boys (ages 7,8,9,10) and you are so right on..."The love in our family - God has given that to us." What a gift! Thanks for the tender reminder. That is so precious and made me cry...oh I love my little children and their sweet thoughtfulness just like you love yours.